Arts and entertainment events happening in Kent. Calendars are published Wednesdays and Saturdays on a space-available basis. Items for the Wednesday edition must be submitted by noon the previous Thursday. Items for the Saturday edition must be submitted by noon the previous Tuesday. Sococulture: For information about cultural events throughout South King County, visit www.sococulture.org. Wings of Freedom Tour: 2-5 p.m. June 20; 10 a.m.-5 p.m. June 21-22. Ground tours available of Boeing B-17 Flying Fortress “Nine O Nine” WWII Heavy Bomber; Consolidated B-24 Liberator “Witchcraft” WWII Heavy Bomber; North American B-25 Mitchell WWII Medium Bomber; and P-51 Mustang. The Museum of Flight, 9404 E. Marginal Way S., Tukwila. www.collingsfoundation.org. Musicians Emeritus Symphony Orchestra: 7:30 p.m. June 14. Cost: $10 donation. First Evangelical Presbyterian Church, 19800 108th Ave. S.E., Renton. MESO-orchestra@comcast.net. The Singing Brawners: 4 p.m. June 15. Filipino couple Rita and Felix Brawner to perform traditional music. Cost: $20-$40. IKEA Performing Arts Center, 400 S. Second St., Renton. 253-288-3557. Renton City Concert Band: 7:30 p.m. June 19. 70-piece band performs everything from Broadway to classics. Cost: $5-$7. IKEA Performing Arts Center, 400 S. Second St., Renton. 425-430-6700 or 425-430-6707. Coulon Family Concert Series: 7 p.m. Wednesdays, June 25-Aug. 13. Free outdoors concerts. Performers: June 25, Renton City Concert Band; July 2, Duwamish Dixieland Jazz. Gene Coulon Memorial Beach Park, 1201 Lake Washington Blvd. N., Renton. 425-430-6700 or www.rentonwa.gov. Cascade Lanes, Lounge and Casino: 9 p.m.-1 a.m. Nightly band performances, including: June 13-14, Kickstart; June 20-21, Knucklehead; June 27-28, Trix. Open to ages 21 and older. 17034 116th Ave. S.E., Renton. Friday Night Jazz: 7 p.m. June 20, Hook Me Up Jazz Quartet; 7 p.m. June 27, Doug Ostgard Jazz Quartet. Baker Street Books, 32709 Railroad Ave., Black Diamond. 360-886-2131. Gonzo’s Bar and Grill: Ongoing: 9 p.m. Wednesdays, karaoke. Open to ages 21 and older. 15423 S.E. 272nd St., Suite 101, Kent. www.gonzosbarandgrill.com. Interchange Bar & Grill: 9 p.m.-1 a.m., including: Thursdays and Saturdays, karaoke; Fridays, band performances; Sundays, free pool. Performers include: June 13, Cylas; June 20, Jet City Players; June 27, Knucklehead. Open to ages 21 and older. 8429 S. 228th St., Kent. 253-854-5650. Pat’s Bar and Grill: All performances 8 p.m.-midnight unless otherwise noted. Ongoing: 8 p.m. Thursdays, jam nights. 114 Railroad Ave. N., Kent. 253-852-7287 or www.patsbar.com. Poppa’s Pub: 9:30 p.m.-1:15 a.m. Saturdays, live music. 510 Washington Ave. N., Kent. 253-850-2812. The Royal Bear Pub and Eatery: Performers: June 13, NRG; June 27-28, Black Dog. 35731 W. Valley Highway, Algona. 253-833-6686. “I Do! I Do!”: June 13-29. Cost: $15-$20. Renton Civic Theater, 507 S. Third St. 425-226-5529 or boxoffice@rentoncivictheater.org. “Theseus and the Minotaur”: 7 p.m. June 16. Musical presented by HOME Program. Cost: Free. IKEA Performing Arts Center, 400 S. Second St., Renton. 425-204-2521. “The Complete Works of William Shakespeare (Abridged)”: 8 p.m. Fridays-Saturdays and 2 p.m. Sundays through June 29. Three actors set out to perform all 37 of Shakespeare’s plays in 97 minutes. Cost: $12-$15. Auburn Avenue Theater, 10 Auburn Ave. 253-929-6680 or www.experience-art.org. Comedy Night at the Ave: 7:30 p.m. June 19. Performers: Key Lewis, Tony Boswell and Jack Mayberry. Recommended for ages 18 and older. Cost: $15-$20. Auburn Avenue Theater, 10 Auburn Ave. 253-931-3043 or www.auburnwa.gov/arts. Skyway Park Bowl and Casino: 8:30 p.m. Thursdays, live stand up comedy. Headliners: June 12, Huck Flyn. 11819 Renton Ave. S., Seattle. 206-772-1220. Petite Feet Performance: 2 and 3:30 p.m. June 14. Presented by Children’s Dance Theater. Cost: $3-$5. Rainier Middle School, 30620 116th Ave. S.E., Auburn. 253-887-8937. VCC Shopa Naida Kuchaipuda: 6:30 p.m. June 14. Cultural ballet performance features artists from India. Call for cost. IKEA Performing Arts Center, 400 S. Second St., Renton. 425-442-5886. Southside Dance Force: 7 p.m. June 21; 2 p.m. June 22. Cost: $20 in advance; $25 at the door. IKEA Performing Arts Center, 400 S. Second St., Renton. 253-639-5829 or www.ssdanceforce.com. Boots & Laces Square Dance Club: 7:30-10:30 p.m. the first and third Fridays of the month. Meridian Grange, 15422 S.E. 272nd St., Kent. 425-413-0084 or www.bootsandlaces.org. Evening ballroom dance: 7:30-9:30 p.m. the second, third and some fourth Tuesdays of the month. Features live music by The Good Times Band. Open to all ages. Cost: $4. Kent Senior Activity Center, 600 E. Smith St., Kent. 253-856-5164. Kings of Swing swing dance: 7:45-9:30 p.m. the first and last Tuesdays of the month. Open to all ages. Cost: $4. Kent Senior Activity Center, 600 E. Smith St., Kent. 253-856-5164. Ring ’N Swing Square Dance: 1:15-3:15 p.m. Thursdays. Cost: $3. Kent Senior Activity Center, 600 E. Smith St., Kent. 253-856-5164. Square dancing: 7:30-10:30 p.m. the second and fourth Saturdays of the month. Sponsored by Pi R Squares. Cost: $4. Meridian Grange, 15422 S.E. 272nd St., Kent. 425-432-0138 or www.pi-rsquares.org. Swing dance classes: 3 and 4 p.m. Tuesdays through December. 3 p.m., Swing 1. No experience necessary. 4 p.m., Swing 2 (Lindy Hop). Must pass Swing 1 or have teacher’s permission. Cost: $5 for students; $7 for non-students. Student Union Building at Highline Community College, 2400 S. 240th St., Des Moines. Des Moines. www.kevinbuster.com. Tuesday Afternoon Dances: 1:15-2:15 p.m. Tuesdays. Free dances feature music styles ranging from ballroom to rock ’n roll. Kent Senior Activity Center, 600 E. Smith St., Kent. 253-856-5164. Wagon Wheel Square Dance Club: Beginning lessons: 7:30-9:30 p.m. Tuesdays. First three lessons are free. Dances: 7:30-11 p.m. the first and third Saturdays of the month. Meridian Grange Hall, 15422 S.E. 272nd St., Kent. 206-915-1415. Kent Historical Society Museum: Hours: Noon-4 p.m. Wednesdays-Saturdays. Admission: $1. Bereiter House, 855 E. Smith St., Kent. 253-854-4330. Black Diamond Historical Society Museum: Hours: 9 a.m.-4 p.m. Thursdays; noon-3 p.m. Saturdays and Sundays. 32627 Railroad Ave., Black Diamond. 360-886-2142, museum@blackdiamondmuseum.org or www.blackdiamondmuseum.org. Renton History Museum: Free tours: 11 a.m. the third Saturday of the month. Hours: 10 a.m.-4 p.m. Tuesdays-Saturdays. Closed on holidays. Admission: $3 for adults; $1 for children; free for ages 7 and younger and members. 235 Mill Ave. S. 425-255-2330 or www.rentonhistory.org. Ryan House Museum: Hours: 1-4 p.m. Saturdays-Sundays and 7-9 p.m. the first Wednesday of the month through August. Closed on holidays. Cost: $1 for adults; 25 cents for children. 1228 Main St., Sumner. 253-299-5780. White River Valley Museum: Exhibits: Through Aug. 10, “Crazy Quilts: Puzzle Patches and Fanciful Embroidery.” Events: 1-3 p.m. June 14, “Quilt Restoration and Preservation” class and tour. Hours: Noon-4 p.m. Wednesdays-Sundays. Admission: $1-$2; free on Wednesdays. 918 H. St. S.E., Auburn. 253-288-7433 or www.wrvmuseum.org. Hydroplane and Raceboat Museum: Hours: 10 a.m.-5 p.m. Tuesdays; 10 a.m.-10 p.m. Thursdays; 10 a.m.-4 p.m. Saturdays. Admission: $10 for adults; $5 for students and seniors; free for ages 4 and younger. 5917 S. 196th St., Kent. 206-764-9453. Auburn City Hall Gallery: Exhibits: Through July 3, artwork by Anthony Huss and Cara Jennings, with artists reception 5:30-7 p.m. June 11. Hours: 8 a.m.-5 p.m. Mondays-Fridays. Admission: Free. Auburn City Hall, 25 W. Main St. 253-931-3043 or www.auburnwa.gov. Centennial Center Gallery: Hours: 8 a.m.-5 p.m. Mondays-Fridays. 400 W. Gowe St., Kent. 253-856-5050, www.ci.kent.wa.us/arts. Cheryl Sallee Gallery: Exhibits: Through June 27, Senior Artists’ Exhibit. Hours: 8 a.m.-5 p.m. Mondays-Fridays. Admission: Free. Auburn Senior Activity Center, 808 Ninth St. S.E. 253-931-5043 or www.auburnwa.gov/arts. New Earth Gallery: Hours: 11 a.m.-5 p.m. Tuesdays-Fridays; 10 a.m.-5 p.m. Saturdays. 213 W. Meeker St., Kent. Seahurst Art Gallery: Events: 10 a.m.-5 p.m. June 14, open house. Exhibits: Through July, pottery by Don Schindler. Ongoing: Paintings by Nancy Bogni, Marianne Perkins and Cathy Woo. Hours: Noon-5 p.m. Wednesdays-Saturdays. 15210 10th Ave. S.W., Burien. 206-244-7844 or www.seahurstgallery.org. Unexpected Productions 25th Anniversary Events: 6 p.m. June 13-midnight June 15, 54-Hour Improvathon; 8:30 p.m. June 16, Theatresports 25th Anniversary Show; June 17-22, International Festival of Improv. Call for cost. The Market Theater, 1428 Post Alley, Seattle. 206-587-2414 or www.UnexpectedProductions.org. KPLU Listener Request Show: 7:30 p.m. June 14. Presented by Seattle Repertory Jazz Orchestra. Cost: $15-$36. Benaroya Hall, 200 University St., Seattle. 206-523-6159 or www.srjo.org. “Busytown”: Through June 15. Play brings Richard Scarry’s “What do people do all day?” to life with music and puppetry. Recommended for ages 4 and older. Cost: $17-$33. Seattle Children’s Theatre’s Charlotte Martin Theatre, 201 Thomas St., Seattle Center. 206-441-3322 or www.sct.org. Mighty Aphrodite: 12:30-5 p.m. June 15. Snacks and coffee will be available. Presented by Puget Sound Traditional Jazz Society. Cost: $8-$11. Ballard Elks Lodge, 6411 Seaview Ave. N.W., Seattle. 425-776-5072 or www.pstjs.org. Theory of a Deadman: 8 p.m. June 17. Canadian band to perform. Cost: $15. Showbox SoDo, 1700 First Ave. S., Seattle. 206-628-0888 or www.ticketmaster.com. “Recapturing the Banjo”: 7 p.m. June 17. Otis Taylor and Band to perform songs from their latest album. Cost: $25-$30. The Triple Door, 216 Union St., Seattle. 206-838-4333 or www.thetripledoor.net. Dimitriou’s Jazz Alley: Performers: June 17-18, Esperanza Spalding; June 23-24, Maceo Parker. Call for cost. 2033 Sixth Ave., Seattle. 206-441-9729 or www.ticketmaster.com. “A Marvelous Party—The Noel Coward Celebration”: June 19-July 13. Comedic revue offers some of Coward’s best-loved songs. ACT Theatre, 700 Union St., Seattle. 206-292-7676 or www.acttheatre.org. Discover the Niña: 9 a.m.-6 p.m. June 19-24. Replica of Columbus’ ship will dock in Seattle for self-guided tours. Cost: $3-$5; free for ages 4 and younger. Center for Wooden Boats, 1010 Valley St., Seattle. 787-421-0402 or www.thenina.com. “Avenue Q”: Through June 22. Call for cost. The Paramount Theatre, 911 Pine St., Seattle. 206-292-2787 or www.theparamount.com. “Namaste Man”: Through June 22. One-man show explores what it means to be an artist, and what it means to go home. Intiman Theatre, 201 Mercer St., Seattle. 206-269-1900 or www.intiman.org. “Wait, Wait … Don’t Tell Me!”: 7:30 p.m. June 26. Join a live taping of NPR’s oddly informative news quiz. Call for cost. The Paramount Theatre, 911 Pine St., Seattle. 206-292-2787 or www.theparamount.com. 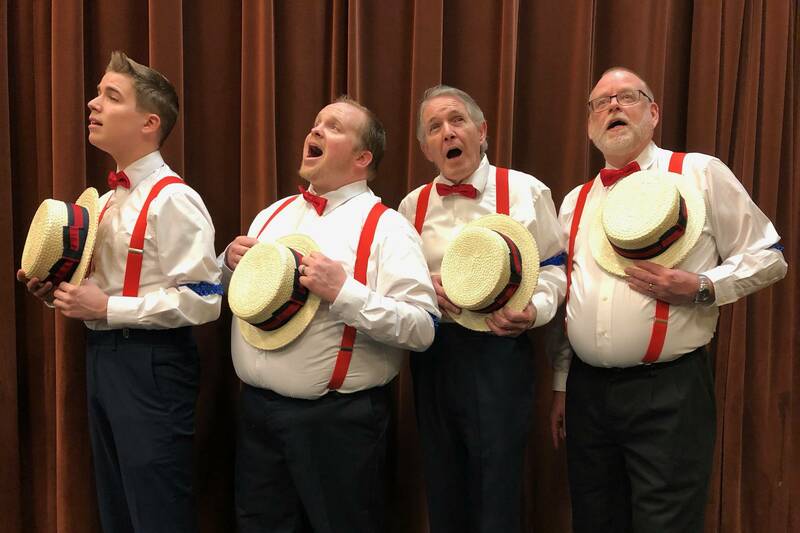 Seattle Men’s Chorus—“Comedy Tonight”: June 27-28. Call for cost. McCaw Hall, 305 Harrison St., Seattle Center. 206-388-1400 or www.flyinghouse.org. “Adventures in Mating”: June 27-Aug. 9. Play offers a comedic choose-your-own-adventure about a first date. Theater Schmeater, 1500 Summit Ave., Seattle. 206-324-5801 or www.schmeater.org. Seun Kuti & Egypt 80: 8 p.m. June 28. Cost: $25-$35. The Moore Theatre, 1932 Second Ave., Seattle. 206-628-0888 or www.themoore.com. “All’s Well That Ends Well”: Through June 29. Presented by Seattle Shakespeare Company. Cost: $20-$34. Center House Theatre, 305 Harrison St., Seattle Center. 206-733-8222 or www.seattleshakespeare.org.